Volumes increasing, what does this mean for used car prices? Used car prices under pressure. Convertible prices are levelling out. Due to the extended break over Easter, April has hardly got going and we are already at the middle of the month. What’s clear is the downward direction of most used car values. From our analysis levels of stock in the market have been steadily increasing since the middle of February meaning up until the end of March, demand and supply were fairly well matched, resulting in stability for values. With part-exchange vehicles now hitting the market in high numbers and a quiet Easter period, for the first time this year supply is exceeding demand, prices are struggling and we see no immediate let up in sight. Whilst the best quality cars are still selling, it is the older, poorer condition offerings that are suffering and with prices generally heading in one direction, vendors are mindful to now accept bids that they may not have deemed acceptable a matter of weeks ago. This drop in values is pretty much across all sectors, with SUVs the worst affected. Even convertible prices are levelling out however, as they are not immune to the increase in supply across the whole market. There will always be exceptions but these are few and far between. I predict there are likely to be more cars in the used car market in 2015 than there were last year and this will lead to depreciation, but it’s important to reassure that there is certainly no glut and no crash on the horizon. Prices need to realign in order to keep the volumes moving and our live data helps you keep on top of what’s happening in the market now. 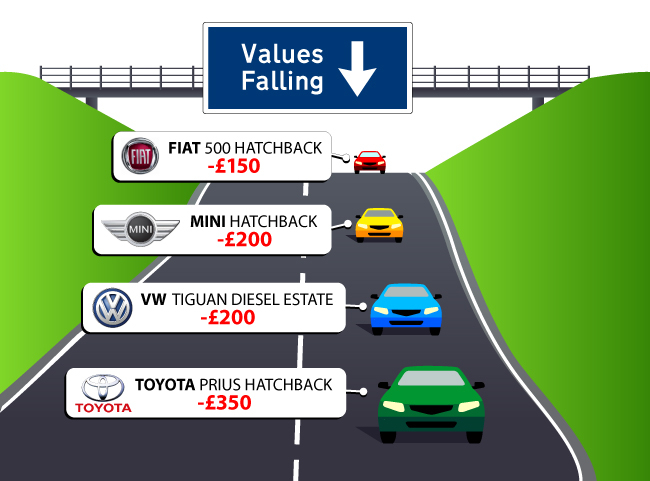 Track day-to-day changes in brand and model values using CAP’s Black Book Live.